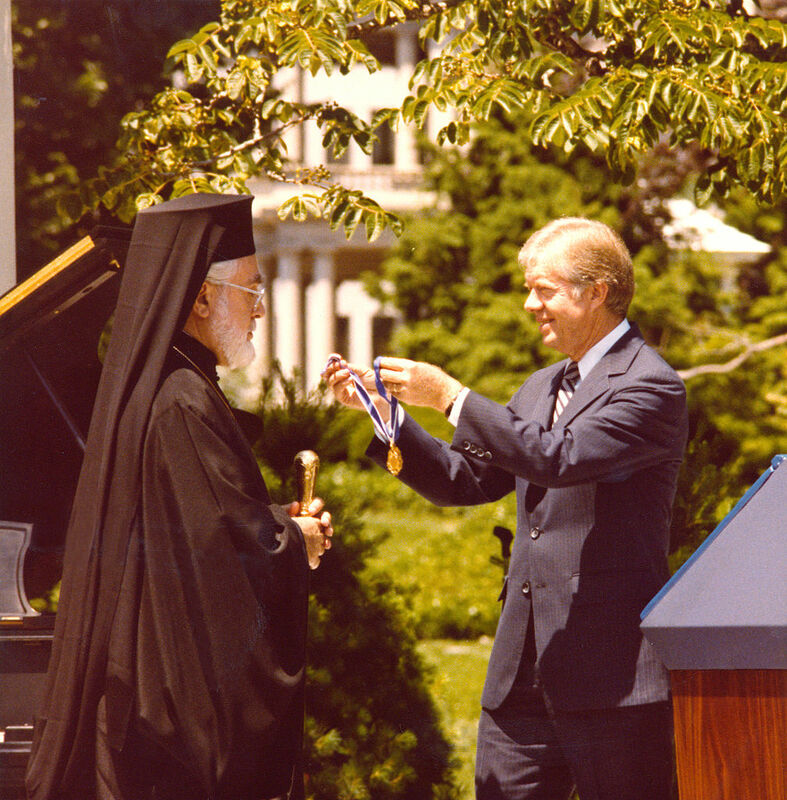 Archbishop Iakovos receives the Presidential Medal of Freedom from President Jimmy Carter, June 9, 1980. June 10, 1870: The Holy Synod of the Russian Orthodox Church created the Diocese of the Aleutian Islands and Alaska. Previously, Alaska — or, before its 1867 sale to the United States, “Russian America” — was part of the Diocese of Kamchatka. Making Alaska its own diocese was part of the transition in the wake of the 1867 sale. Four weeks later, Bishop John Mitropolsky was consecrated to head the new Alaskan diocese, but he actually set up his headquarters in San Francisco — outside of the official diocesan territory. June 8, 1891: After three years of unceasing scandal, the Russian Holy Synod removed Bishop Vladimir Sokolovsky and reassigned him to a see in Russia. He was replaced by Bishop Nicholas Ziorov, who stabilized the diocese and oversaw its expansion throughout the United States. June 4, 1896: Mikhail Borisovitch Maximovitch was born in the province of Kharkov, in what is now Ukraine. He went on to become the great Archbishop John, serving as a ROCOR bishop in Shanghai, Western Europe, and finally San Francisco. He was canonized in 1994. June 5, 1901: Fr. Misael Karydis, pastor of Holy Trinity Church in New Orleans, committed suicide in a New York hotel. In December 2009, I wrote a pair of articles on this tragic (and mysterious) incident; click HERE and HERE to read them. Fr. Misael was born in Bulgaria in October 1847. He came to New Orleans in 1880 or ’81, and was the priest there for 20 years. Those 20 years witnessed tremendous changes in American Orthodoxy. When Fr. Misael arrived, his New Orleans parish was one of just three Orthodox communities in the contiguous United States (San Francisco and New York being the other two). His parish was under the Church of Greece, although the extent of that relationship, and Fr. Misael’s own ecclesiastical affiliation, are unclear. It’s hard to get a good handle on the sort of person Fr. Misael was. We know that, in 1888, he got into a fistfight with a Greek newspaper reporter. In the days following his death, reports surfaced that he was a reclusive inventor, obsessed with building a flying machine (this was two years before the Wright brothers’ flight at Kitty Hawk). More darkly, there are suggestions that he may have abused children. Why he committed suicide in New York, rather than New Orleans, is not really clear. Apparently, he left New Orleans after receiving word that his father had died in Bulgaria. Arriving in New York, he met with Greek consul Demetrius Botassi, checked into a hotel under a false name, ate dinner, and then shot himself. He lingered for a bit before dying, but wouldn’t talk to anyone. The whole thing is really mysterious, and if you want to learn more, check out the two articles I linked to above. June 8, 1907: Bishop Platon Rozhdestvensky was elevated to Archbishop and assigned to replace St. Tikhon as primate of the Russian Archdiocese in America. Platon served in America until 1914, when he was reassigned to a prominent see in the Russian Empire. He returned to America in the wake of the Bolshevik Revolution and the Russian Civil War. June 6, 1926: Fr. Arseny Chahovtsov was consecrated in Belgrade, Serbia to be the Bishop of Winnipeg, Canada. This was at a time when the Russian Metropolia was a part of ROCOR, and the consecration itself was presided over by ROCOR’s First Hierarch, Metropolitan Antonii Khrapovitskii. It also had the blessings of the Serbian Patriarch and Metropolitan Platon Rozhdestevsky of the Metropolia. June 10, 1926: Fr. Moses Abihider died. He had immigrated to America in 1908 and served as a priest under St. Raphael Hawaweeny in the Syro-Arab Mission. For the great majority of his career, he was assigned to Springfield, MA. Fr. Moses must have been close friends with Archbishop Aftimios Ofiesh, because one of his sons was named Aftimios and had the archbishop as his godfather. In 1999, Aftimios Abihider was the publisher of the biography of Aftimios Ofiesh, written by Ofiesh’s widow Miriam. Fr. Moses is perhaps best known for being featured on the tombstone of St. Raphael. He is one of six clergymen listed along with the great bishop, and all were at one time buried together at Brooklyn’s Mount Olivet Cemetery. However, in 1988, the remains of St. Raphael and two of the others (Bishops Emmanuel Abo-Hatab and Sophronios Beshara) were transferred, along with the tombstone, to the Antiochian Village in Pennsylvania. It seems most likely that Fr. Moses’ remains are still at Mount Olivet. June 10, 1927: Fr. Panagiotis Phiambolis, one of the first Greek Orthodox priests in America, died in St. Louis at the age of 87. A married priest, he came to America in 1892 to become the first pastor of the first Orthodox church in Chicago. Later, he served in Boston and then St. Louis, where he remained for the rest of his life. While in St. Louis, his parish split in 1910 and then reunited in 1917. Fr. Panagiotis retired the following year, at age 78. His daughter Helen Jannopoulo went on to become an accomplished author, and her book And Across Big Seas recounts events from her own life, including a lot of details on the family’s move from Greece to Chicago. June 10, 1931: The future Antiochian Metropolitan Philip Saliba was born. One of the most exciting days of my Presidency was a year or so ago when we had this entire lawn almost filled with delighted Greek Americans who share with me and others the admiration that we all feel for the next honoree. I’d like to ask Archbishop Iakovos to come forward. Greek Orthodox Archbishop Iakovos has long put into practice what he has preached. As a progressive religious leader concerned with human rights and the ecumenical movement, he has marched with Dr. Martin Luther King, Jr. and has met with the Pope. As the Primate of the Greek Orthodox Church of North and South America concerned with his congregation, he has given guidance to millions.